He was transferred to South Carolina for 6 months training on a bomber unit. He was one of the units that was able to fly the new shiny B25. 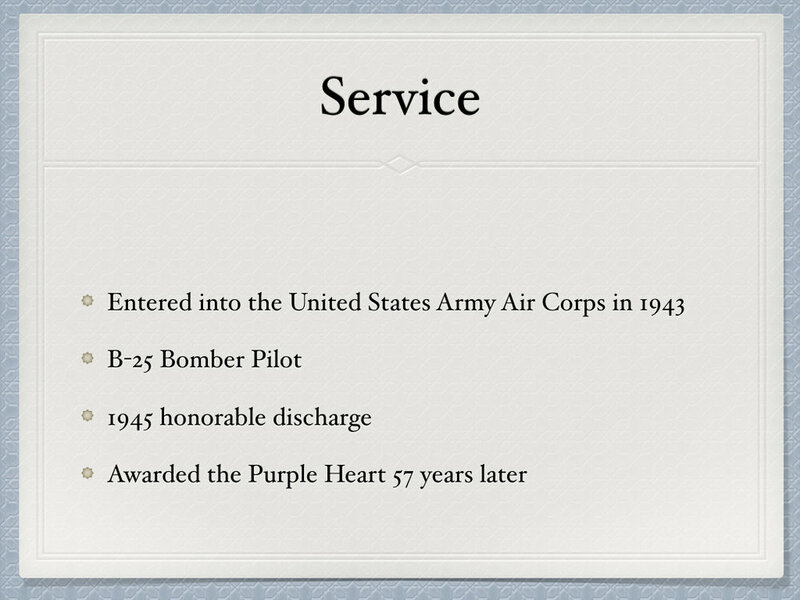 He earned his flight wings in August 1943; sixteen months after joining the military - he was sent to join the fight. His first combat missions were against a Japanese airfield. He can recall seeing black spots in his vision; seconds later realizing he was being shot at. 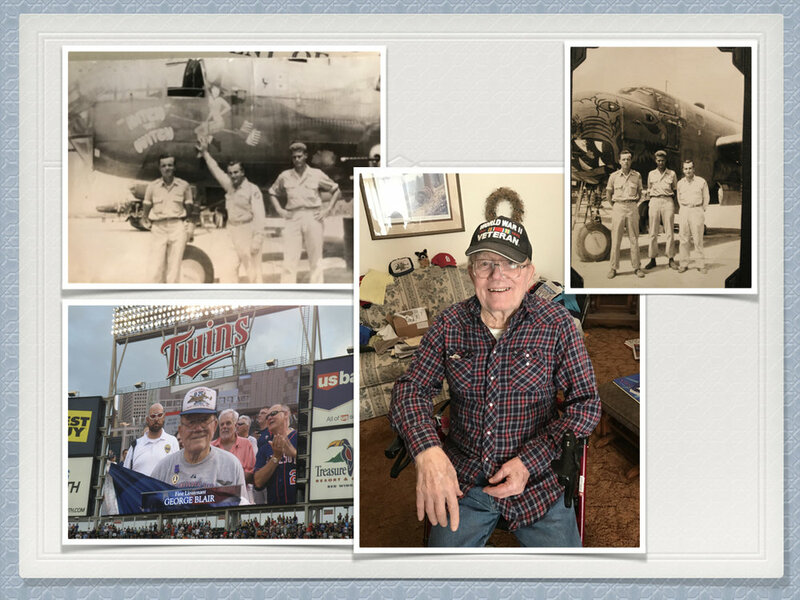 For close to a year, he flew 46 more combat missions. March 28, 1945 found him on an immense mission. During that mission, his fleet was dropping 27 bombs at max speed from low altitudes and using their .50 cal machine guns. The return fire created an oil leak in the starboard engine. Mr. Blair decided to shut down the engine and try to continue on a single engine, 15 miles back to mainland. It was no longer a good idea; if they had landed, they would become Prisoners of War. In a last second decision, they decided to take to the water in hopes of a US rescue. Another flight had radioed in for them and dispatched a US submarine that was patrolling around. As the bomber was skimming across the water, he hit his head on the gunsights and lost consciousness. Soon after, Mr. Blair woke up and the other crew members were already in the water. He had to inflate each side of his vest while fighting the 10 foot swells. Wave after wave would hit him making it difficult to breath. Just when he thought he was going to give up; he looks up to see Viola (sweetheart) in color with the sky in the background. He told himself that if he wanted to get home to see her, he better start fighting for his life. Soon thereafter, the US submarine showed up and pulled him to safety. That was Mr. Blairs last combat mission. After healing from many stitches in his head and other responsibilities, he was able to come back to SD. He and Viola were married, but only after the war was over in November of 1945. He sent a telegram home to his parents requesting they send him his best suit. He only bought her a wedding ring - due to how expensive the engagement rings were. Fast forward 20 years later, Mr. Blair asked her what she wanted for an anniversary gift? She replied an engagement ring, which she got that year. Not long after, they bought their first ranch and would fully retire in 1995 on their Pleasant Valley place. They have 9 children, 25 grandchildren, and 8 great-grandchildren. Mr. Blair served in the SD legislature from 1978-1986. Mr. Blair’s hobbies include: baseball, crosswords, playing scrabble, and ultimately spending time with family. Mr. Blair has been awarded the Purple heart, Asiatic-pacific theatre medal , Air medal, American campaign medal, WWII victory medal, Philippine liberation medal and Bronze star.